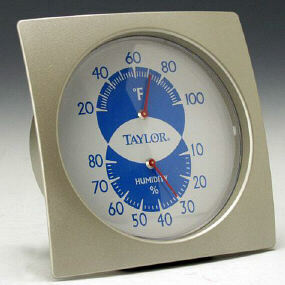 Displays relative humidity and temperature. 4" square molded case hangs or stands. Temperature range 20° to 100°F. Humidity range 10 to 80%. Red pointers. Weather resistant and rustproof. Displays relative humidity and temperature. Contemporary styling for any room in the home. Design allows for hanging or standing.